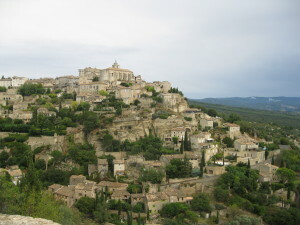 At the summit of a perilously steep cone of rock, surrounded by plains of rolling Luberon farmland, in the South of France, is the “village perché” (literally, the perched village) of Gordes. Viewed from an equally perilous (and unfenced!!!) 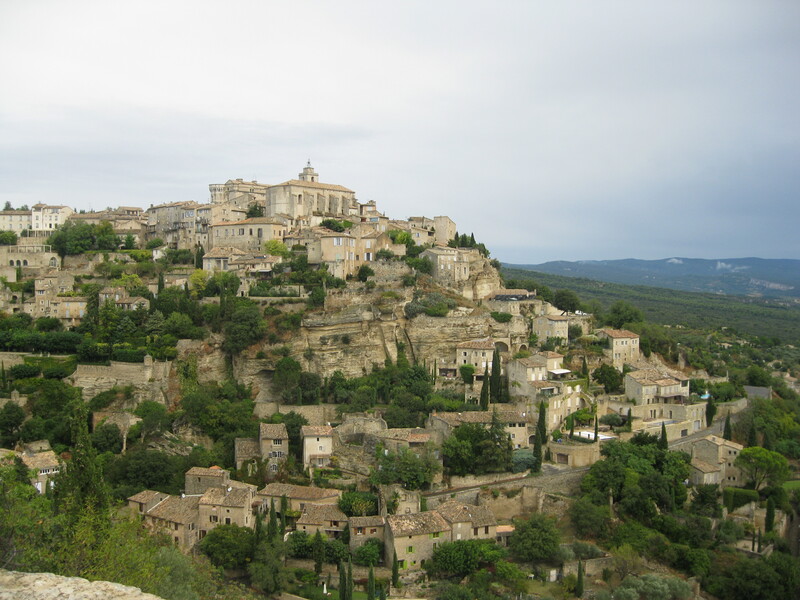 cliff top on the approaching road, Gordes is absolutely breathtaking. Its church and its 500-year-old castle dominate the skyline. Tiers of bleached stone dwellings spill down the hillsides below. Gordes centres around a quiet, village square, shaded by the church. Steep, narrow streets lead away from it, always downwards. Views of the sunlit countryside below, come and go, framed between the dark buildings, like the glimpses of distant paradise often seen in the background of classical paintings.